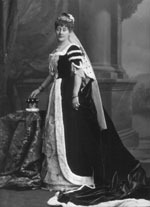 Edith, Countess Cawdor, née Edith Georgiana Turnor (d. 1926). Sitter: Edith, Countess Cawdor, n�e Edith Georgiana Turnor (d. 1926). Biog: Eldest daughter of Christopher Turnor, of Stoke Rochford, Lincs. ; m. (1868) Frederick Archibald Vaugham Campbell, 3rd Earl Cawdor. Furniture & Props: Painted backdrop; draped side-table.